If you don't know the work of the late William Stafford, you should! He has a way with words that extends beyond poetry--he was a teacher, a critic, an explainer of poetry, etc. He also has a big following! I discovered a website devoted to, actually more like a "devotion" of, William Stafford. The "Resources" page has numerous links to more information about William Stafford, as well as links to videos. Lewis and Clark College holds the William Stafford Archives and its online site has some of Stafford's poems in draft form that you can study. Check it out here. 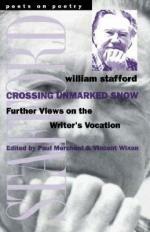 Crossing Unmarked Snow: Further Views on the Writer's Vocation by William Stafford [811 STA] is an interesting book in that it is not strictly poetry, but covers a little of everything including this poem, "An Afternoon in the Stacks." A great one for a librarian to promote! words adjusting themselves to their meaning. of it will haunt all that follows in my life. A candleflame in Tibet leans when I move. Stop by Live. Love. Explore! with Irene Latham for the Poetry Friday Round-Up. I feel the same way about cheese as does Wallace of Wallace and Gromit fame [DVD WAL], "I'm just crackers about cheese!" I'm not ready, though, to try my hand at making my own (homemade yogurt is tricky enough), but if you're one of those do-it-yourselfers, look for this book on our "New Books" shelf, Cheesemaking: Self Sufficiency by Rita Ash [637.3 ASH]. This book was published in 2010, so should have all the latest information on cheesemaking. Besides the basics, it also includes recipes, serving suggestions, and information on selling your cheeses. If you're not that adventurous, but would like to learn more about cheeses, then look for The Cheese Companion: The Connoisseur's Guide by Judy Ridgway [641.373 RID]. And to learn the secrets of hosting a cheese and wine party, check out the DVD, The French Chef: With Julia Child [DVD 641.5944 FRE]. Bon appetit! How WikiLeaks works can be further understood by looking at the site's guidelines. We have plenty more, just go to our catalog and type in "Afghanistan." Yesterday I spoke briefly about the use of sports psychology in improving your game (whatever it may be). Today, I'm going to look at the other side of sports psychology--a side that at best is comical, and at worse, is crippling--superstition. Don't Step on the Foul Line: Sports Superstitions [J 796.357 SUL]. In it you'll find superstitious athletes such as baseball's Wade Boggs who had 80 rituals, one of which was eating chicken every day of the season! It you are interested in learning more about humans and why they're so superstitious, look for Believing in Magic: The Psychology of Superstition by Stuart A. Vyse [133.43 VYS]. Maybe your kids might like to read this novel about superstition in baseball: Two Hot Dogs with Everything by Paul Haven [J HAV]. The Sluggers are a baseball team whose past is filled with hundreds of defeats and near misses. Year after year, they play the kind of baseball that challenges the most faithful of fans. But when it comes to Slugger supporters, there’s a whole other category. Die-hard fans who rely on elaborate superstitions to support their team. Fans like Danny Gurkin. When Danny and his friends learn that a mansion with ties to the Sluggers’ history is slated to be demolished, they make a desperate pilgrimage to see what can be done to save it. There Danny uncovers a flavor of gum created by the original team owner, a 19th-century bubblegum tycoon. Danny helps himself to a few packs and discovers that chewing the gum gives him the ability to alter the Sluggers’ future. But Danny’s secret comes at a price and before long he’s in hot water with just about anyone who has a stake in the game. 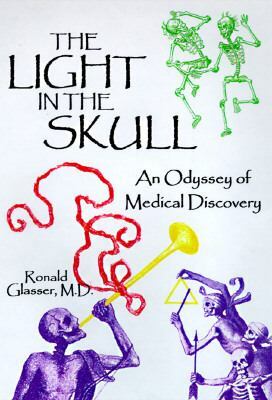 Sounds like a fun summer read, doesn't it? It's amazing what we can do if we "psych" ourselves up (or out) sufficiently. Sports psychology is the topic of a number of books in our collection including Terry Orlick's In Pursuit of Excellence: How to Win in Sport and Life through Mental Training [796 ORL] and Thinking Body, Dancing Mind: TaoSports for Extraordinary Performance in Athletics, Business, and Life by Al Chung-liang Huang [796 HUA]. 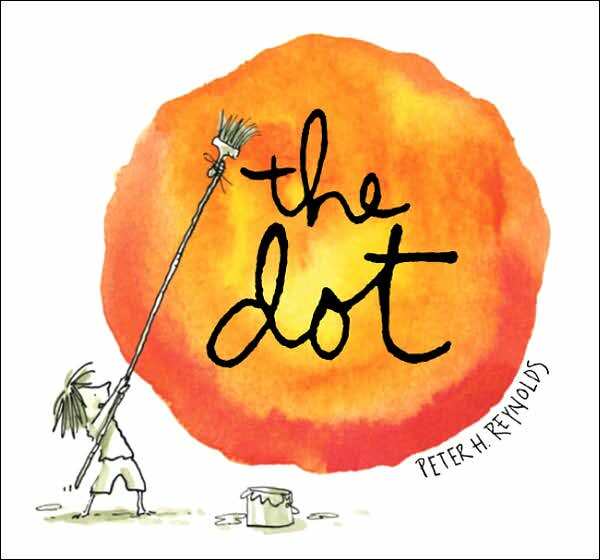 Here's an article on the subject with the intriguing title, "Psychology of Sport: How a Red Dot Swung It for Open Champion." Red dot? 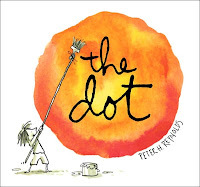 Speaking of dots...there's a picture book for kids, The Dot by Peter Reynolds [JP REY] that deals in a round about way with psychology for kids! We have a rather weighty volume of poetry with the grand name, The Best Poems of the English Language From Chaucer Through Frost, selected and with commentary by Harold Bloom [821.008 BES]. 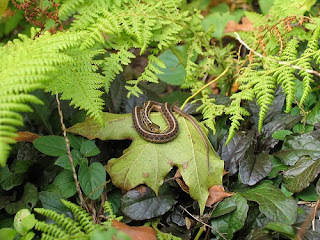 In its pages is a poem by D.H. Lawrence, "Snake," to which I've taken a fancy. Like most people, I'd jump if I saw a snake at my feet. But, once over my initial surprise at seeing it, I'd be happy to spend time watching it. I feel sorry for Lawrence for letting "the voices of my accursed human education" get the better of him. I can only hope that the next time he was honored by the appearance of a much maligned creature he was able to fully enjoy it. Today's Poetry Friday Round-Up is being hosted at Language, Literacy, Love. I've set this, and tomorrow's post, to publish in my absence. I'm headed to the far northern part of the state, a.k.a. 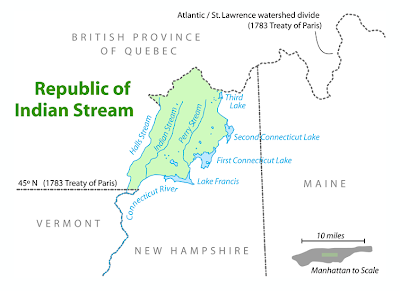 known as "Moose Alley," for a few days of R & R.
I thought I'd look to see what we have that covers the north country's colorful past, most notably, the short-lived Republic of Indian Stream. 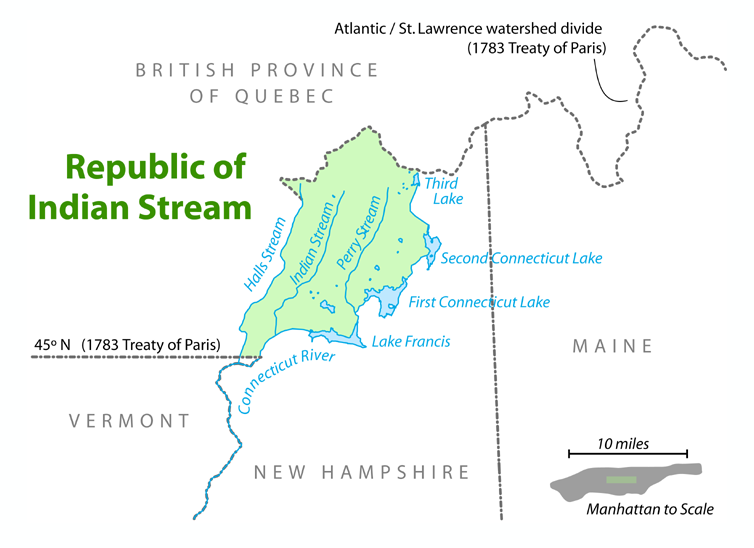 For three years, 1832 to 1835, there was a bit of disputed land between the United States and Canada, which resulted in the citizens of the area being taxed by both nations! Not ones to be taken advantage of, the citizens essentially broke from both nations until the two countries came to an agreement! Impelled by sensuous prose and atmospheric storytelling, Lost Nation delves beneath the bright, promising veneer of early-nineteenth-century New England to unveil a startling parable of individualism and nationhood. The novel opens with a man known as Blood, guiding an oxcart of rum toward the wild country of New Hampshire, an ungoverned territory called the Indian Stream—a land where the luckless or outlawed have made a fresh start. Blood is a man of contradictions, of learning and wisdom, but also a man with a secret past that has scorched his soul. He sets forth to establish himself as a trader, hauling with him Sally, a sixteen-year-old girl won from the madam of a brothel over a game of cards. Their arrival in the Indian Stream triggers an escalating series of clashes that serves to sever the master/servant bond between them, and offers both a second chance with life. But as the conflicts within the community spill over and attract the attention of outside authorities, Blood becomes a target to those seeking easy blame for their troubles. As plots unravel and violence escalates, two young men of uncertain identity appear, and Blood is forced to confront dreaded apparitions of his past, while Sally is offered a final escape. Lost Nation is a vivid tale of unexpected strengths, terrible and sad misconceptions, and the yearning toward civil society in a landscape raw and with little pity for human strivings. In prose both lucid and seductive, it carries us deeply into human and natural conditions of extreme desolation and harrowing hardship, but also the relentless beat of hope and, finally, the redeeming capacity of love. Something tells me I should bring this book along for a little lakeside reading! Every once in a while, I read something that really makes me stop and say "Wow!" That's happened to me just the other day when I read a report on a new form of vaccination--a patch. You really must read about it yourself and see if you don't find it amazing, too! Favorite projects for little kids, and even preschoolers, involve making "beaded" necklaces out of macaroni such as ziti or ditalini. A little older kids get into necklaces and bracelets made of pony beads. But, beading is an ancient art, that is perfect for adults with good eyesight and the patience of a saint. Here in New Hampshire, we have an organization for beaders, The Bead Society of New Hampshire. And, next month, up in Concord, there is a whole convention/conference devoted to beads, beaders, and beading, the Innovative Beads Expo. A look at our catalog shows a number of beading books for adults--The History of Beads: From 30,000 B.C. 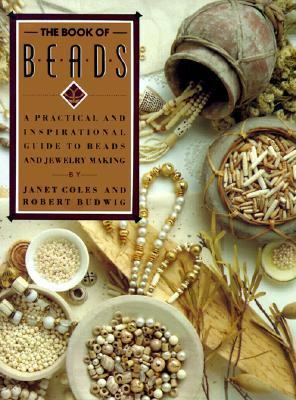 to the Present by Lois Sherr Dubin [391.7 DUB] to The Book of Beads: [A Practical and Inspirational Guide to Beads and Jewelry Making] by Janet Coles [745.58 COL]--and more than a dozen other titles in between. We also subscribe to two magazines for beaders: Beadwork [MAG BEA] and Bead & Button [MAG BEA]. 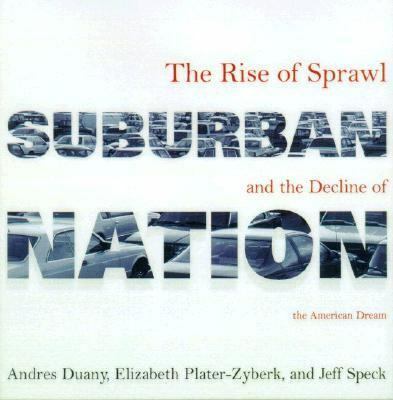 A week or so ago I heard a story on NPR's Marketplace about a new museum devoted to "suburban life." It includes a 1950's ranch style home that was once a model home. It has been moved to and set up at the museum site in Kansas. I wish that the museum were closer so that I could visit. I was raised in the suburbs. My family bought a home in a "development," about 45 minutes outside of New York City, in the early 50's. Over the past year and a half, Eleanor Ross Taylor was a finalist for the National Book Critics Circle Award for Captive Voices: New and Selected Poems, 1960-2008 [844.54 TAY], she won the William Carlos Williams Award from the Poetry Society of America, also for Captive Voices, and, she was awarded $100,000 as part of the Ruth Lilly Poetry Prize. If this wasn't notable by itself, consider this, Taylor was born in 1920! Ninety years old! Here's a poem from Captive Voices, a bit of tongue-in-cheek advice that young writers would do well to heed! To sanatorium, prison, and the pall. 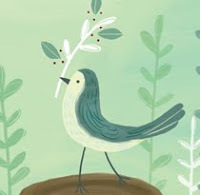 Visit Heidi at My Juicy Little Universe for the Poetry Friday Round-Up. "Little people"--fairies or otherwise--have always captured people's imaginations. Now, little people are showing up in teensy street art pieces around England and Italy. 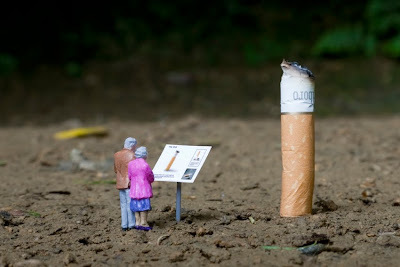 They are the creation of Slinkachu, whose blog is called Little People - A Tiny Street Art Project. Here at the library, we have many, many books featuring little people--from Gulliver's Travels by Jonathan Swift in our adult section [F SWI], to The Littles series books by John Peterson in children's [J PET]. If fairy-type little people are your thing, there's the Daisy Meadows series (Pet Fairies, Weather Fairies, Jewel Fairies, etc.) [J MEA]. For little dolls-come-to-life, there's The Doll People by Ann M. Martin [J MAR]. And, if you're looking for something to do with the kids one rainy summer's day, try constructing little people art pieces of your own to display under your rhododendrons! 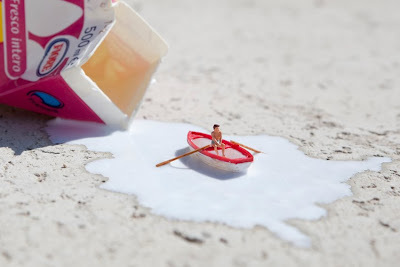 Many thanks to Slinkachu for permission to use photos from his blog! Not an idle warning--it seems that garden veggies are ripening a little early this summer, so, there will be a number of gardeners who will try to pawn off an abundance of zucchini and summer squash. Never fear! We have a gazillion vegetable cookbooks including ones devoted entirely to summer squash. I found a recipe online with the intriguing title "Zuccaghetti." Check out the photo, it looks so cool and refreshing! 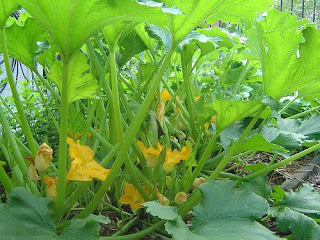 If your squash crop isn't up to par, you may want to borrow this book: Rodale's Vegetable Garden Problem Solver: The Best and Latest Advice for Beating Pests, Diseases, and Weeds and Staying a Step Ahead of Trouble in the Garden by Fern Marshall Bradley [635.049 BRA]. Keys to the Repository by Melissa de la Cruz is #5 in the "Blue Bloods" series. Linger by Maggie Stiefvater is the sequel to Shiver. The Necromancer by Michael Scott, book #4 in the "Secrets of the Immortal Nicholas Flamel" series. The little creature you see above, caused quite a ruckus here on Friday! It had settled itself on a white car. Carolyn spotted it and came running in to tell us about the spider that looked like a skull. 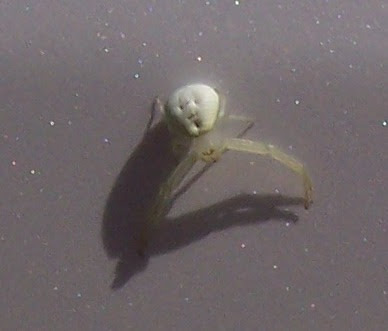 Its legs were practically see-thru and it was so very, very white, I assumed it must be an albino. Lois took the photo and I sent it off to some friends, one of whom identified it as Misumena vatia or a goldenrod spider sent a link to this page on Wikipedia. She also mentioned that it was the inspiration for Edvard Munch's "The Scream." We have lots of spider books here in the library, including The World of the Spider by Adrienne Mason [595.4 MAS], which is full of colorful photos. The extent to which humans' lives have been enriched by these animals is immeasurable; many of our most basic habits of work, play, transport, and warfare would have been impossible without them. 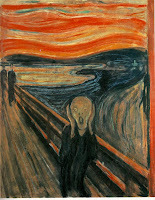 It is no wonder that this profound relationship has inspired countless works of art, from ancient times to the present. Giddy up over to Carol's Corner for the Poetry Friday Round-Up. Yeehaa! 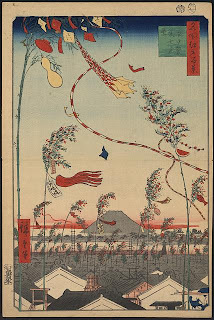 Yesterday, July 7, was Tanabata, also known as Star Festival. Star Festival celebrates the one day each year that two lovers are allowed to come together. The Milky Way, a river made from stars that crosses the sky, separates the lovers, but they meet each year on the seventh day of the seventh lunar month. You can read the Chinese version of this legend in the children's book, Legend of the Milky Way by Jeanne M. Lee [JP LEE]. In Japan people put wishes on long strips of paper and hang them, and other streamers, from trees to flutter in the breeze. This is something anyone can do and makes for a fun activity for children and their parents. Pick up Traditional Crafts from Japan by Florence Temko [J 745.5 TEM] to inspire your creative celebrations. Tanabata activities can be found here. If you'd like to use Japanese words on paper wishes, start with First Thousand Words in Japanese [J 495.6 FIR], then pick up Essential Kanji, 2,000 Basic Japanese Characters Systematically Arranged for Learning and Reference by P.G. O'Neill [495.6 ONE]. With the weather as searing hot as it has been this week, you'd be foolish to venture out to the beach without an umbrella to sit under! Umbrellas are clever devices, especially those that now fold up to a tiny 6" package, which you can fit into a pocket or bag. Who invented the first umbrella? Wikipedia has a history of the umbrella, and gives a nod to Egypt, here. A look at several sources, though, reveals that it was either the Egyptians or the Chinese, but whoever it was, umbrellas have been around for a long time! Contemporary artists have found umbrellas to be an inspiration, and a surprising number have created installations featuring umbrellas. 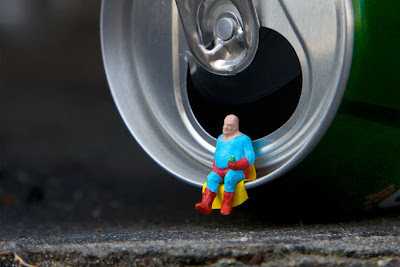 Eighteen such installations can be found here. I'd like to highlight a brand new book The Thingamabob by Il Sung Na [JP NA]. 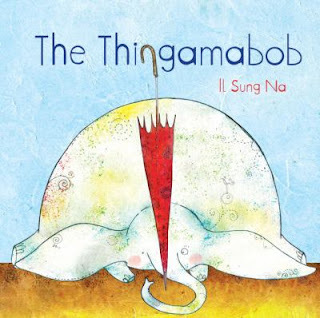 It is a simple story about an elephant who finds a "thingamabob" and ponders its use. Even the endpapers are delightful with multicolored umbrellas splashed across them! Years ago, couponing was really big. Women went grocery shopping with envelops bulging with coupons. (I'm not being sexist, but I've never seen a man carting around more than a coupon or two.) There were couponing newsletters and articles in magazines about super-savers. Then, after a while, interest faded out. But now, IT'S BACK! The internet has made couponing easy again. There are sites such as Coupons.com, MoneySavingMom.com, and CouponMom.com that have coupons just waiting for you to print off. 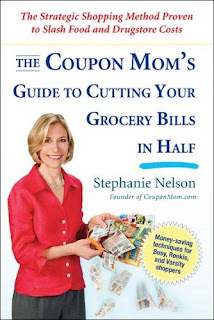 Coupon Mom also has a book, The Coupon Mom's Guide to Cutting Your Grocery Bills in Half: The Strategic Shopping Method Proven to Slash Food and Drugstore Costs by Stephanie Nelson [640.73 NEL], which will get you started if you're a coupon newbie. I know of a young woman who has taken up couponing to help pay off her school loans--and, she's succeeding! She has even started a blog, Couponing With Kari, where she shares her couponing coups. You needn't be, shall I say, "obsessive" like Kari, but, every little bit counts in today's tough economic times. The Library is closed today to celebrate the Fourth of July holiday and to give the Library staff a well-deserved break. This summer, although only 2 weeks old, has been crazy busy! Check out our website for photos of activities that have taken place already, and for events that are yet to happen. 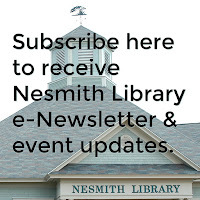 Click on "Reserve Museum Passes" and explore the museum experiences available to you as a Nesmith Library cardholder. See you tomorrow, when we reopen at 9:00 AM! Poetry Friday--The New U.S. Poet Laureate! Yesterday, the Library of Congress announced the appointment of the new U.S. 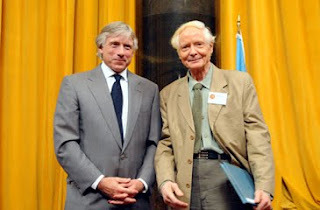 Poet Laureate, W.S. Merwin. Merwin replaces Kay Ryan who has served for the past two years. The author of more than 30 books of poetry and prose, Merwin’s influence on American poetry is profound. Often noted by critics is his decision, in the 1960s, to relinquish the use of punctuation. "I had come to feel that punctuation stapled the poems to the page," Merwin wrote in his introduction to "The Second Four Books of Poems." "Whereas I wanted the poems to evoke the spoken language, and wanted the hearing of them to be essential to taking them in." It's funny, but in reading some of his work, I never noticed the lack of punctuation, whereas, in Cormac McCarthy's novels, I was completely turned off by it! I wonder why? Perhaps because with McCarthy it seemed more like an affectation. In Merwin's work the lack of punctuation seems natural. On the Library's shelf we have two of Merwin's collections,Migration: New & Selected Poems and The Shadow of Sirius [both 811.54 MER]. For today I'd like to offer this Merwin poem from The Shadow of Sirius. I think it is the perfect poem for Merwin's first days on the job! All the best to W.S. Merwin! The Poetry Friday Round-Up is taking place at The Poem Farm. It seems that once the television industry "accepts" a difference in human beings, then the rest of the United States follows shortly thereafter. The wildly successful program, Glee [DVD GLE], has a gay character, Kurt. Being a gay teen is now "socially acceptable" in the media, and, by extension, the viewing audience comes to the realization that differences are normal. Publishers, too, realize that there's money to be made, and so, they're willing to take chances publishing books on topics that were once "iffy." In the past week there have been at least two mainstream media reports on the topic of gays in books for young adults. 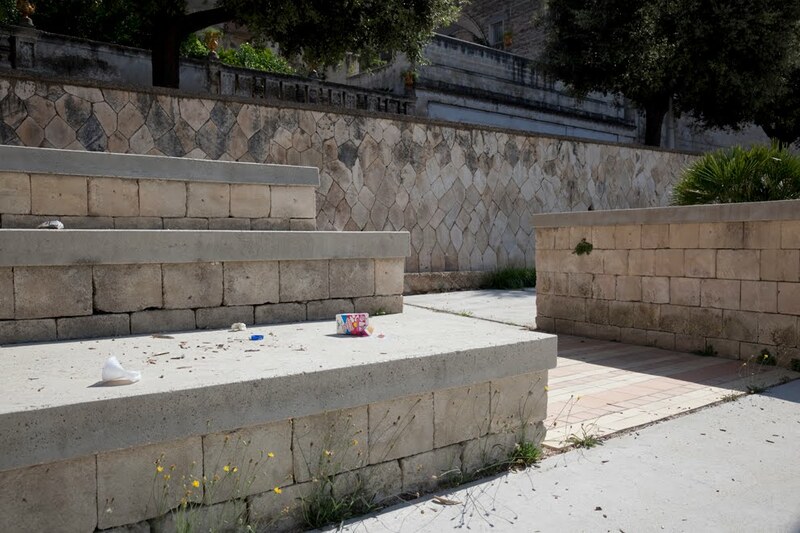 One was found in the Christian Science Monitor, and the other on the CBS News website. If you're looking for more books with gay characters, check our catalog under the subject, "Homosexuality -- Fiction," or visit these pages by authors who write about, and for, teens: Great Books for Gay Teens put together by Alex Sanchez, or A Printable and Downloadable Gay (GLBTQ) Teen Booklist! by Lee Wind. Also check out the blog Dreaming in Books, to get a teen's perspective on gay (and other) themed books.